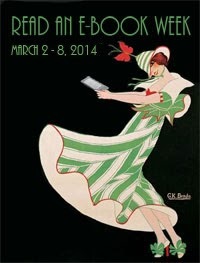 Our lovely friends at Smashwords are putting on a big celebration in honour of “Read an Ebook Week”. To join in the fun, I have decided to put both my novels in the Historical Fiction Romance Series Master of Illusion up for sale in their HUGE discount catalogue. So, from March 2 – 8, 2014, you can buy Master of Illusion — Book One and Master of Illusion — Book Two from Smashwords with a 50% OFF discount coupon. All you have to do is click on the title of each novel above. This will take you to the Smashwords site. When you go to the checkout, enter the discount code REW50 to obtain your savings! This brings each book down to $2.02 US for one week only. If you have never tried Smashwords, don’t be shy. It’s very easy to use for purchasing ebooks. It allows you to purchase via PayPal, so that may alleviate any fears with regards to online purchases and security. It also offers the ability to download ebooks in any format you like. So you can read on your Kindle, iPad, IPhone, Tablet, Computer and so on! Hurry to claim your 50% discount before March 8, 2014! This entry was posted in Discount Promotion, Historical Fiction, Historical Mystery, Historical Romance Novels, Historical Romance Series, Self-publishing and tagged discount promotion, discounted ebooks, Ebook promotion, half-price promotion, Historical Fiction, historical romance novels, historical romance series, read an ebook week, Smashwords by Anne Rouen Admin. Bookmark the permalink.